A modern design that was lauded for its unique approach, compact size and easily accessible information. 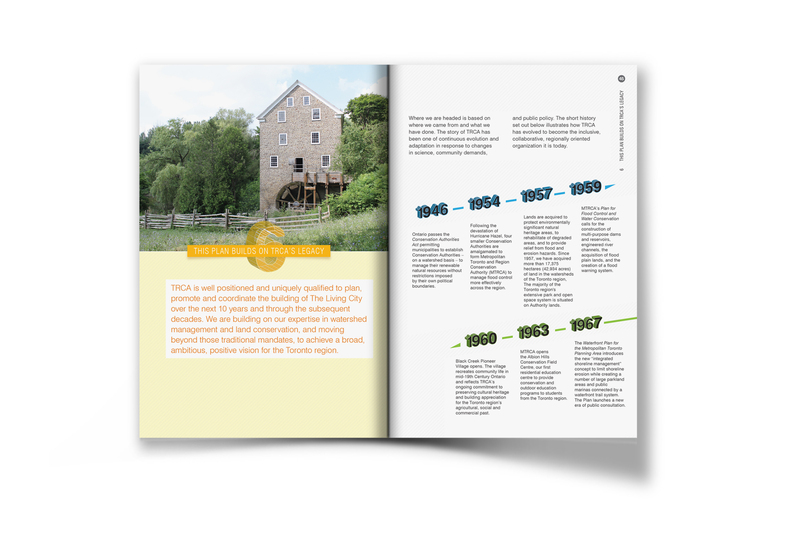 The design of this booklet was used as a template towards an updated edition of the Plan. Toronto and Region Conservation Authority is the largest conservation authority in Ontario. Its jurisdiction covers 3,467 square kilometres (2,506 on land and 961 water-based) comprising of 9 watersheds. (Source: trca.ca). With over 400 employees, TRCA oversees many programs and policy implementations. Its scope is wide ranging, from public tree plantings to permit property and land development. 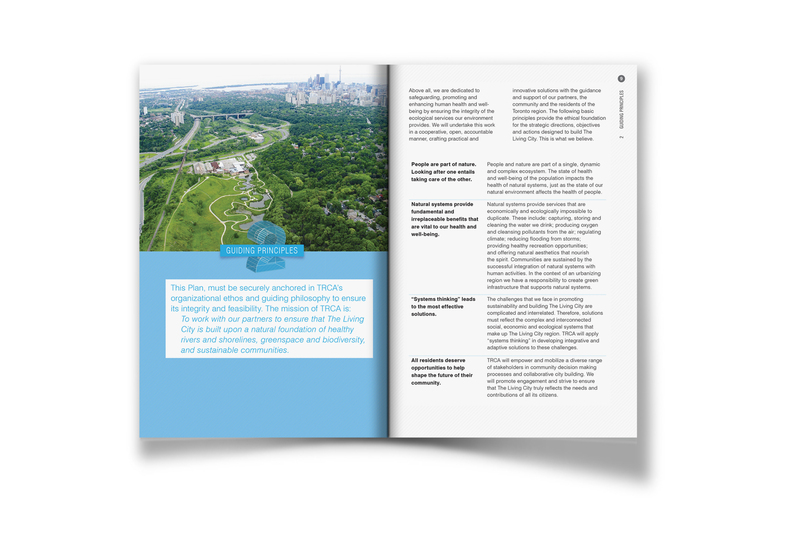 In its effort to better align its objectives and mission, TRCA created a 10-Year Strategic Plan. The design brief for the Stratetic Plan included the design of the information to be in a visually clear and consistent manner. Additionally, all current employees of TRCA are to be given a copy of the Plan. In order to meet these design objectives, a compact size was established (6in x 9in/15cm x 22.85cm). This dimension allows employees to easily take the book wherever possible. Second, the design and layout of the information is presented in a manner that distinguishes each section, and its accompanying text, clearly and succinctly. Finally, I designed the cover so that the word "Building" wraps around the front, spine and back. 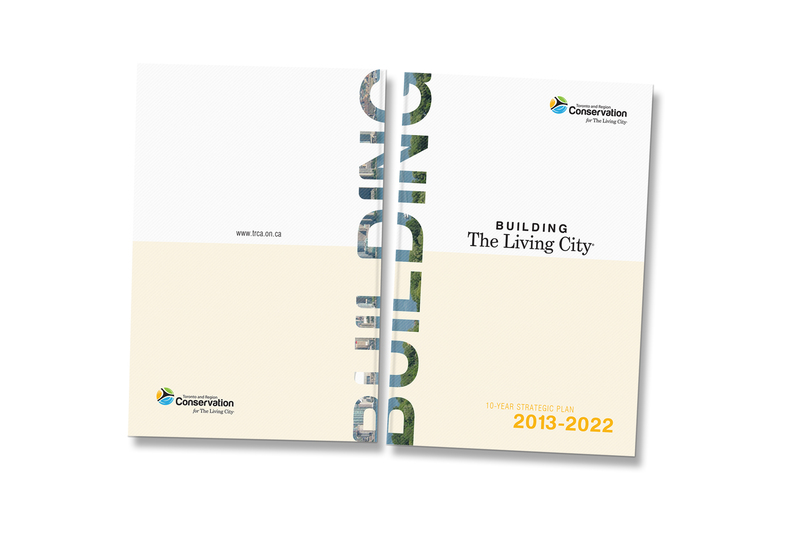 When two booklets are joined together spine-to-spine, they form the word "Building". Watch how it works.